SPRING SALE - Rates Reduced by 35% - Spring Powder Awaits! Property Size 2,340 sq. ft.
Condo Building is about 100 feet from the water. Views are similar to a cruise ship, expansive and directly over the water to the surrounding mountains. The water is breathtaking all seasons and provides the ideal setting for soaking in the hot tub stargazing. Beach access during the warmer months is a short 5-minute walk on a trail behind Anderson Cove, where guests launch their boats. Grill burgers on the deck and spend days skiing, biking or boating. There’s no doubt about it this condo is the spot for Après Ski. Depending on weather, the covered deck off the main level wraps around much larger than the other deck layouts at Lakeside Village. On the main level deck there’s an outdoor grill, hot tub and sitting areas. The lower level has wet bar and with barstool seating and a second living room. The walkout patio is covered and has a fire-pit with abundant seating outside. This floorplan is the largest at Lakeside Village at 2300 SF, has a one-car garage, two living areas, three (3) bedrooms and two (2.5) and half baths. The master suite with a king bed and ensuite bathroom is located on the main level. The lower level has a queen bedroom and a bedroom with two twins. The lower level bedrooms share a bathroom. The Lakeside Village development offers a plethora of amenities not found at one location in the area. 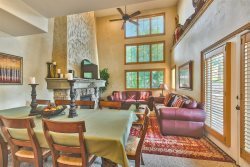 The clubhouse is accessible to its homeowners and guests providing a pool table and lounge area with fireplace to relax after a long day or recreation. Lakeside Village as two tennis courts, swimming pool, kids pool, community hot tub, reserved boat parking, beach access and a significant grassed back lawn abutting to the lake that is popular for family reunions and events. During the Winter, UTA (public transportation) has regular pick-up times at Lakeside Village to Snowbasin. The Legend of Snowbasin is true. It is the Epitome of luxurious ski lodges and has the ambiance of an upscale hotel. Guests will not find “funky” or rustic here. Snowbasin and Sun Valley, Idaho are under the same ownership, which exudes quality for its discerning guests. Where else in North America will you find day lodges with Murano hand-blown red and blue chandeliers and fixtures throughout, Chapman brass lamps, European antiques, French tapestry walls, Italian marble floors, ski valet and upscale detail to every space. At the base is the bold Earl’s Lodge, named after Earl Holding, the visionary of both ski areas. Earl’s Lodge sports the Cinnabar Lounge that has live music almost daily for Après Ski and a full bar to order menu items. Earl’s Lodge also cafeteria style dining with a carving station, made to order wok dishes and salads, fresh pizzas and a grill serving burgers and brats. Utah’s popular microbrews are on tap. Outside dining is popular when the sun is out. The Huntington Room at Earl’s Lodge hosts special events and is available for private events. The Skier Service Lodge at the base houses ski rentals, retail shop and excellent ski schools. The Needles Lodge is located at the top of the high-speed Middle Bowl Gondola and offers a similar cafeteria-style menu serving views from the top. The John Paul Lodge is located adjacent to the Olympic Tram but has a Mongolian style Architecture that is dynamic in its setting and offers dining with a view of jagged peaks. On the Strawberry Gondola base is a small lodge with street tacos and a coffee shop. And then there’s the Mountain. Snowbasin was the site of the 2002 Olympic speeds events. The brave venture to the top of the Olympic Tram to drop into the Grizzly Face at the top. Snowbasin has 3000 skiable acres with 3000 vertical feet and two high-speed gondolas to warm from the bottom to the top of the mountain and over again. Skiers are Snowbasin ski more terrain with low lift line waits (if any) and fast access to the top. There are three sections of the mountain to explore – Strawberry, Middle Bowl and John Paul that are easy to access all in one day. Each section takes you to the top of the world! Working with Art Hobson was a pleasure. Immediately available to help us check in. Loved it. Best quality at lowest price of all the ski properties I've rented. All reservations are billed a one-time processing fee of $30. Departure clean is $150.